Peanut butter and chocolate are a match made in heaven. Both flavours come through clearly in this recipe. As I did with my regular chocolate chip cookies, I have used both vegetable shortening and butter. The flavour and texture of the cookie is both buttery and slightly crisp on the outside with a softness on the inside thanks to the shortening. These cookies are delicious to eat on their own or you can make these into ice cream sandwiches with some chopped salted peanuts and dark chocolate for garnish. You will not be disappointed! In a standing mixer fitted with a paddle attachment or with a handheld mixer, cream together the shortening, butter and sugar. Once light and fluffy, add the eggs and mix until combined. In a separate bowl, sift the flour, baking soda and salt together. Add to the mixer and mix on low to combine. Once incorporated, add the peanut butter and chocolate pieces and mix on low just until the ingredients are evenly distributed. Using a 1 ½-inch scoop, or soup spoon, drop rounds of the dough onto the lined baking sheets and bake for approximately 10 minutes or until golden around the edges. Allow the cookies to cool slightly on the baking sheets and then transfer to a wire rack to cool completely. Repeat with the remaining dough. Once the cookies are completely cool, fill a wide, shallow bowl with chopped salted peanuts and dark chocolate chips and mix to combine. Place a few scoops of the ice cream onto the bottom of a cookie, and place another cookie on top. Press gently to spread out the ice cream and to create a sandwich. Roll the exposed ice cream in the peanuts and chocolate and place the sandwich on the lined baking sheet in the freezer. 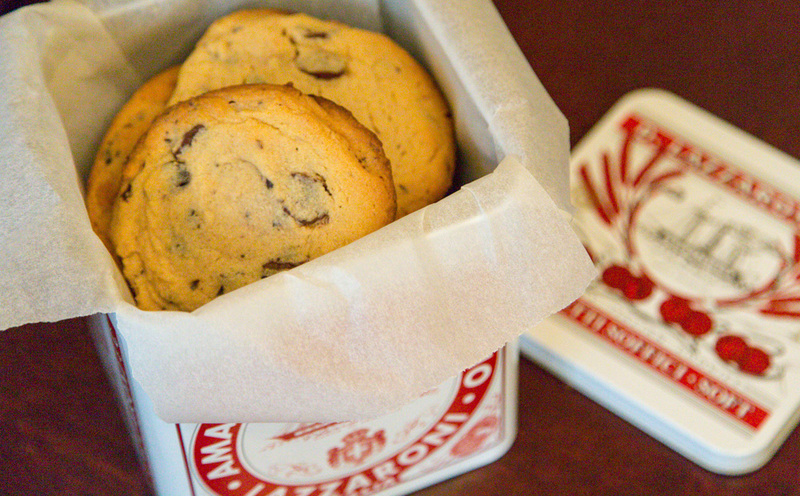 Continue with the remaining cookies until all of your sandwiches have been assembled. Keep sandwiches in freezer until ready to serve.